I've been battling a stiff clutch pedal ever since I did my T56 swap. So stiff I broke the clutch pedal twice. My Centerforce DF and mechanical clutch was lighter than what I have now. I pretty much ruled out alignment last year. Today I hooked up a pressure gauge. - Off the -3AN line that comes straight off the MC I get 1000-1200 psi and I didn't even hit my pedal stop. I noticed that at the bleeder, it drained fluid quickly when i put on my pressure gauge. However when I disconnected the feed line, virtually no fluid at all came out. Does this tell me something? Anyone have ideas from above results? Blockage, bad MC, etc? Are you sure your line isn't too small at -3? I wouldn't say it is a bad MC as you show that you have 1000-1200psi, which then drops to 500 at the end of the line(if I understand correctly). It seems like there is blockage or restriction in the system somewhere that isn't allowing fluid to flow--thus the hard pedal. If it were air, it would make it spongy. I have researched this a bunch and it is very similar to a braking system. Your master cylinder being that large also means it will be more difficult to press, but not so much that it should break your pedal. Do you know your current pedal ratio? That would have an affect on it as well, but I would think there is something else in the system causing the blockage somewhere being that your master has that much pressure. I know I read about this on LS1 Tech and it turned out to be a blocked line. Guy had a clutch issue. I know on my camaro I will need to raise the point where the master attaches to the pedal point about 1 inch, or 2 inches from the pivot point on the. Yours might be a combination of a large bore with a pedal ratio that needs adjusted for the system. The MC comes with a -3 outlet, plus I called Tilton (which have -4 lines) if it would be okay and they said it should be fine. Pedal ratio is stock, I did measure it and I think it was 5.25 or 5.5:1. Not quite as much as a racing 6-6.25:1 aftermarket pedal but what I ran before with the mechanical CF and had no issues. If I remember correctly, the 13/16 bore MC should add about 6-8 lbs of extra pedal effort compared to a 3/4 bore MC. I think that was even based off of around 40-50 lbs of effort. In other words, the larger bore would be noticeable, but not massively difference. I hope it'd be a blockage (as long as it's not in the release bearing), but where would that blockage be? How would I know? That is confusing.. and -3 should be fine but who knows! Usually it would cause a pedal sticking to the floor issue if it is too small. I would think it is minimal like you said. Is it rock hard force, or does it still move and just really hard? I don't know what would be a blockage in there, I mean it is just a braided line and you're seeing pressure differences on both sides of the MC. That clutch is supposed to be on of the lightest around on top of all that. You may need to adjust the pedal ratio. This is a good read about it. All hooked up, the clutch is very stiff. Not rock hard, but much stiffer than my old setup. A hydraulic setup with McLeod twin disc should be MUCH lighter than a mechanical linkage Centerforce DF single disc with the same pedal ratio. Right now with only the gauge hooked up to the -3 line, the pedal nearly rock hard. I'd say I get 1000 psi with about an inch of travel at the pedal. Though I am not sure if I should be able to fully stroke the piston with just a gauge hooked up. Is the slave cylinder new or used? 1. Clutch pressure plate failure. What is new and what is used in your system, exactly? I don't know much about this other than what I'm reading right now, but both my '79 Toyota and '02 Dodge PUs have hydraulic clutch systems and they're like buttah. Attached is the engagement Psi curve of a Ram 10.5" 2800lb Powergrip HD PP released by a Howe HRB using a 3/4" Wilwood master, highest number recorded was 419 Psi. Racepak sensor for clutch Psi was attached to the end of the HRB's bleed hose. I use -4 to plumb the clutch myself, but -3 is commonly used with no problems at all. Shouldn't take over 500Psi to actuate the PP. Master cyl size will have no effect Psi to release, but MC size does effect effort at the pedal. If you are seeing wildly different pressures at the master vs at the HRB, I suspect some sort of blockage. Psi should be the same in both places. We make your non-adjustable clutch...ADJUSTABLE! I believe it is all new according to his youtube videos. As for how hard it should be to press. You're right it should be super easy to push in comparison. You may have a screwed up slave cylinder or pressure plate issue. I believe he measured at the MC and at the bleeder side of the TOB/slave. If so he would see a pressure drop as the slave expands. If he sees 500psi, at the end of the slave cylinder after expansion, it would seem he has a pressure plate problem. It's a hydraulic system, pressure at all areas within the system should be roughly the same in a system that's static enough to read a gauge. First off pressure should be the same in the system. If there is a restriction you will see a pressure difference, BUT over a period of time it should equalize. If there is a blockage you will not move the pedal. The 2 things that will make it easier to push is pedal ratio OR a smaller master cylinder. Moving the arm up closer to the clutch pedal pivot will make it easier to push. Conversely a smaller master cylinder will make it easier as well. BOTH these options will require you to stroke the pedal a longer stroke. Measure the distance it takes to release the clutch. If it’s about 2” of stroke on the pedal, use either of the options above. Be aware though when using a smaller master cylinder you can only go so small until there is insufficient volume of fluid to release the throwout bearing. The pressure spike you are noticing could simply be that the pedal ratio is incorrect and you are stroking 75% of the master cylinder in the first 2” when really it should take 4”. If all you have hooked up is the gauge you will NOT be able to stroke the pedal. The gauge is no different than having a plug in the end of the line. Also, that pressure really does not tell you anything other than what pressure the master cylinder is capable of. I dont know how the Tilton system is made but is there any chance the throwout bearing is binding on the front bearing retainer of the trans ? I had an 83 Chevy truck and the TO bearing would bind up and make it almost impossible to push the clutch in. I would get under the truck and squirt some oil on it and all would be well again. Sounds like something is in a bind. Like all of the others have said a hydraulic clutch should be very easy to push. Everything was brand new when I put it in. Master cylinder, linkages, hydraulic lines, clutch, flywheel, pilot bushing, release bearing, transmission. Everything except the clutch pedal itself. I have a pedal stop that takes me about 90-95% the stroke of the Master cylinder. 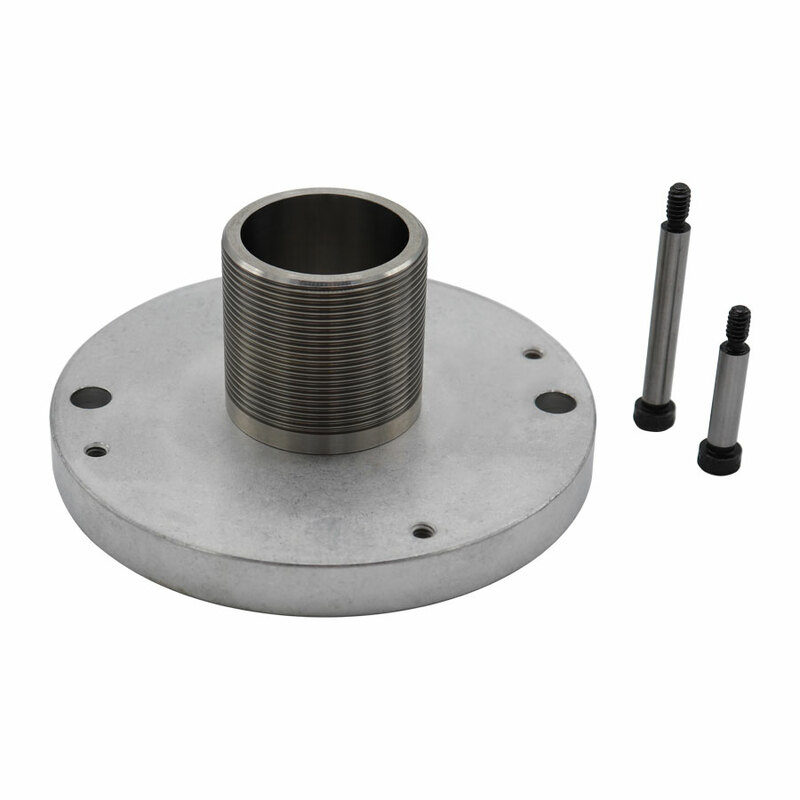 The Tilton bearing screws into this attachment that fits over the front bearing. Theoretically there should be no way for the this bearing to bind. I called Tilton months ago and asked about maybe a seal inside being bad causing internal binding, they said no as it would be leaking. But who knows.